The Association for the Study of Women and Mythology posted the following. We are pleased to announce that ASWM has received a special outreach grant for our 2018 conference. This will fund participation by Native American and indigenous scholars and researchers. Proposals will be read by an outside panel of scholars, and applicants may be asked to provide certification of their tribal membership. ASWM will consider successful grant projects and articles for inclusion in our forthcoming Proceedings series. Our external grants committee invites Native American and indigenous scholars, researchers, artists, and activists to submit critical, creative, and practitioner proposals on topics that address the identity and empowerment of Native American and indigenous women, girls, families, and the environment through women-centered mythologies, earth centered mythologies, story-telling, healing practices, inter-generational exchanges, and traditional knowledge and practices. We encourage work whose objective is to empower both women and the earth to alleviate violence and suffering in both women and the environment. We invite proposals that demonstrate the application of traditional knowledge and wisdom practices in rectifying social justice issues pertaining to women and the environment. As we focus on intersectionality, we reached out to members of other TIGs to solicit their perspectives on and experiences with intersectionality. Three colleagues from different sectors and life experiences discuss how they address issues of diversity, equity, and justice in their evaluation work. Nicole Bowman (Mohican/Lunaape), PhD is President of Bowman Performance Consulting and an evaluator/ researcher with the University of WI-Madison. She currently chairs the Indigenous Peoples in Evaluation TIG and is a member of the Independent Consulting TIG and Multi-ethnic Evaluation TIG. In your own words, how would you describe intersectionality? Intersectionality feels like linear lines but when I practice it, it is round and relational. I enjoy seeing where things “connect” and “are related” (like our Indigenous traditional teachings). So I conceptualize and practice intersectionality as paths crossing on our journey and hopefully paths that continue to circle around and back as I learn and grow from and with others. Describe your feelings about intersectionality (particularly with gender/feminism) and its impact in/on your work? Connecting and relations (AKA intersectionality) are central to my life (academic, professional, and personal). And these are not just thoughts but concrete activities and community-based or Indigenous concepts/frameworks that make my work with intersectionality multi-dimensional. They span the realms of physical, mental, spiritual, and emotional as I carry my work out with and in service to others/community. Gender and feminism are only things I have to think about when the western world impacts my life/work. Traditionally speaking there is balance and male/female (and all things) to keep life running smoothly (and work). Gender and feminism have become more important in my work as we seek to include diversity within all we do and gender, sexuality, (i.e. LGBTQF, etc.) really need to be considered more so that feminism also can be inclusive like evaluation should be with different notions of two spirit people. How can work on intersectionality impact or propel learning to action (this year’s AEA theme)? Gender and feminism have become more important in my work as we seek to include diversity within all we do within evaluation. Making feminism, gender, or sexuality primarily defined, represented by, and framed via a heterosexual lens is not sufficient and also is excluding a large percent of the population. Feminism, gender, sexuality, (i.e. LGBTQF, etc.) really need to be considered more so that evaluators and the field of evaluation is equipped with the skills, knowledge, and abilities to effectively work with, for, and value our two spirit brothers and sisters. Join us on June 8th for the 14th Annual Women’s Business Conference! This full day conference features an exhibitor hall filled with more than 100 business resources, 20 educational sessions for aspiring entrepreneurs and businesses of all sizes, and unlimited networking opportunities! Our new format includes a Power Panel moderated by Sarah Stokes, featuring Sherri Yukel from Big Dot of Happiness, Christina Wiersgalla from Wiersgalla Co., Connie Olson from Micon Cinemas, and Sue Tietz from McDonough Manufacturing. Pre-Register today at WomensBusinessConference.com and pay only $69! Scholarships Available! Students of ALL ages registering with a .edu email address as well as any income-qualifying individual who successfully completes the online scholarship application form will receive a reduced rate of $25! Arrive early and attend the Pre-Conference Event on June 7th, 2-5pm provided by the Chippewa Valley Technical College and the Wisconsin Procurement Institute. Topics covered include Selling to the Government, Women’s Business Certifications, AND Mobile Apps you need to start using today to increase your personal and professional productivity. For more information, go to SuccessfulBusiness.org. *View the entire RFI as a PDF. The City of Milwaukee (City) is issuing this Request for Information (RFI) to identify and research options available to the City in connection with the future possibility of procuring consulting services to conduct a comprehensive disparity study regarding the City’s use of minority and women-owned business enterprises (M/WBEs) as contractors and subcontractors. This RFI is not a formal solicitation or Request for Proposal (RFP). Therefore, no contract will be awarded based upon submissions. This RFI is exploratory, issued solely for planning purposes and gathering information. SBA provides resources to help women entrepreneurs launch new businesses, grow their businesses and compete in the global marketplace. With our online resources, financing opportunities and Women’s Business Centers, we’re here to help you succeed. On Saturday, Native Americans in Philanthropy (NAP) joined the national Women’s March on Washington as part of the Indigenous Women Rise collective. The collective is comprised of: Advance Native Political Leadership, NAP, Native Voice Network, Native Voices Rising, National Indian Women’s Resource Center, UltraViolet, The Continental Network of Indigenous Women of the Americas, North American Region, Indigenous Environmental Network, and other key organizations working to advance Indigenous Peoples issues and rights. Many others joined in support online and walked in solidarity in D.C. and in 20 cities at sister marches across the country. Indigenous Women Rise even had a contingent in Peru representing at the Women’s March there! Indigenous women were among the last to sing along Constitution Ave. Discrimination. It stops with you. If not you, then who? 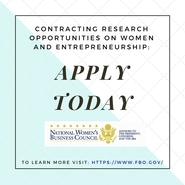 SBA Contracting Research Opportunities on Women and Business: Apply Today! The Small Business Association is asking for applications for nine research projects! Find out exactly what they’re looking for in the email from The National Women’s Business Council below. As you know, the Council is committed to supporting women in business by producing best-in-class, actionable research. Therefore, we are excited to announce our biggest research portfolio yet! We are currently soliciting proposals for nine – yes 9 – research projects. This research will be used as a springboard for action and policy recommendations. Strong proposals are those that not only demonstrate thorough knowledge of the entrepreneurial environment, but are also thoughtful and innovative. *Please check individual listings for submission deadlines and directives for the proposals as they vary. The full proposal solicitations and synopses are listed at www.fedbizopps.gov. If you have any direct formal questions about these opportunities, please contact John Babcock, Contracting Officer for the Small Business Administration, at john.babcock@sba.gov, by the deadlines listed for each one. Apply today for one of these exciting projects. Or send this listing around —and share this blog post —to help us spread the word about these great research opportunities with the National Women’s Business Council. We look forward to reading your proposals! The National Women’s Business Council is a nonpartisan federal advisory council created to serve as an independent source of advice and counsel to the U.S. Small Business Administration, the U.S. Congress, and the White House on issues of impact and importance to women business owners, leaders and entrepreneurs. The Health Issues of Women Veterans Fellowship Program provides two years of post residency, post-doctoral research, education, and clinical learning opportunities to eligible physicians and associated health professionals. Fellows spend approximately 75 percent of their time in research and education and 25 percent in clinical care at selected VA sites. Mentors of national stature provide guidance to fellows in rich learning environments. Graduates are expected to be role models in leading, developing, conducting, and evaluating innovative research, education, and clinical care in health issues pertaining to women veterans. To inquire about the fellowship application process and to learn more about the program, interested candidates should email or write to the site(s) of their choice, including a cover letter and curriculum vitae.